Should you expect the end of the world in 2012? According to today's pop culture, you should. Websites, television shows, various History Channel "documentaries," and the 2009 feature film "2012," all point toward 2012 as the end point of world history. But is it really true? Where does this idea come from? Since the dawn of human civilization, mankind has held a fascination with future events. The desire to know the future is evidenced by the number of popular books and media products touting psychics, Nostradamus, Edgar Cayce, New Age philosophers, and self-proclaimed prophets. But the idea that you'll see the end of the world in 2012 is a rather recent phenomenon. It originates from speculations concerning the ancient Mayan civilization which was once centered in what is now modern day Mexico. 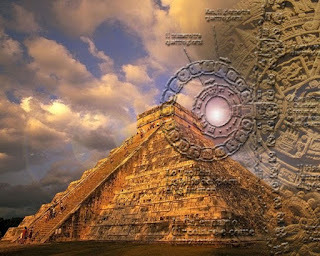 The Mayans erected elaborate temples throughout their land and religiously tracked the movement of the stars and planets. Through their observations, they developed the MesoAmerican calendar, a sophisticated method for keeping track of time. While a detailed examination of the MesoAmerican calendar is beyond the scope of this article, for brevity's sake we'll note that two parts of this calendar system, the Tzolk'in and the Haab, synchronized for a period of 52 cycles (for an equivalent period of 52 years). In order to track more than 52 years of time, the Mayans relied on the use of the Long Count calendar, which moved in 5,125 year cycles. According to many who subscribe to the 2012 end of the world theory, the Mayan Long Count calendar ends its 5,125 year cycle on December 21, 2012. However, what exactly is supposed to happen on that date remains a topic of ongoing debate. Some New Age adherents claim a "consciousness shift" will transform the human race, while others await a golden age of human advancement. Meanwhile, people who think it heralds the end of the world call for a whole plethora of natural disasters such as earthquakes, tsunamis, typhoons, solar storms, and magnetic pole reversals. Some even call for the earth to collide with an asteroid, a comet, or another planet! While Mayan scholars and archeologists dispute these claims, public fascination with the end of the world in 2012 and the specific December 21, 2012 date in particular continues unabated. The publication of numerous books such as New Age author Daniel Pinchbeck's book 2012: The Return of Quetzalcoati (2006) and mega-bestselling novelist Dan Brown's The Lost Symbol (2009) have only served to spread the 2012 phenomenon. Even the History Channel has popularized these theories with a series of programs - Decoding the Past (2005-2007), 2012: End of Days (2006), Last Days on Earth (2006), Seven Signs of the Apocalypse (2007), and Nostradamus 2012 (2008). But is there any truth to the idea that the world will end in 2012? Does the Mayan Long Count calendar provide a glimpse into humanity's future? Forgetting for a moment that Mayan scholars themselves totally dismiss the claim, I can tell you with absolute certainty that the world will NOT end in 2012. Because my worldview doesn't rely on the ideas of fiction writers or New Age gurus, it relies on the one source which has proven its credibility over the course of time, continually defending itself against the harshest of critics while demonstrating an unprecedented track record of foretelling the future. What is this amazing source? God's own Word - the Bible. The Bible's track record as a predictor of future events is well documented. In the past 2,600 years, hundreds of bible prophecies have come to pass while hundreds more remain as yet to be fulfilled future events. Entire libraries have been written about bible prophecy, and its unparalleled record of 100% accuracy is one of the many reasons I believe what it says about our future. So what does the Bible say about 2012 and the end of the world? Does it give any significance to the December 21, 2012 date? Does it call for a magnetic polar reversal or the destruction of mankind? In fact, the Bible states that the planet itself is eternal. However, what isn't eternal is the present age and world in which we live. Okay, you might say. That's all well and good. But could it be that 2012 signals the end of the age and the Glorious Appearing of Jesus Christ as predicted in the Bible? In fact, while Jesus can return at any moment for His followers (an event known as the rapture), the Bible makes it emphatically clear that His Glorious Appearing will not occur on December 21, 2012 or any day in 2012. The Bible states that the Glorious Appearing of Jesus Christ, which signals the end of this age and the establishment of His Millennial Kingdom, will be preceded by a 7-year period known as a the Tribulation. At the midpoint of this 7-year Tribulation, the Antichrist will desecrate the Jewish Temple by engaging in an act known as the "abomination of desolation." So, according to the Bible, the Glorious Appearing of Jesus Christ and the end of this age will NOT occur until at least 3.5 years after the Antichrist desecrates the Temple. Since it's less than 3.5 years before the passing of the December 21, 2012 date, and the Antichrist has not desecrated the Jewish Temple, we can say with absolute confidence that this popularized date has no bearing in regard to the return of Christ or the end of this age. And since the end of this age will not come until Christ returns, we can be certain that neither the world nor this age will end in 2012. In fact, just as the year 2000 approached with an abundance of media attention and even outright panic over Y2K, only to pass without incident - you can put me on record as saying December 21, 2012 will come and go without the end of the world. Am I saying nothing of significance will happen on that day? No. I'm not a prophet, and something newsworthy might very well happen on that day. But, because of the Bible, I can say with absolute confidence that it won't be the end of the world or a worldwide "consciousness shift." Given the lack of evidence, as well as the scholarly refutation of the Mayan Long Count calendar's ultimate meaning, why are so many people willing to believe in the 2012 end of the world idea? My guess is the people who subscribe this theory are really searching for something from which they can derive a spiritual significance. Something that allows them to believe in a higher power or a higher intelligence. If so, then I've got good news. A higher power and a higher intelligence does exist. He's the God of Israel, but you won't draw closer to Him by studying the Mayan calendar. However, you can build a solid relationship with Him by studying His Word, the Holy Bible. While December 21, 2012 doesn't herald the end of the world, you do live in the end times. The modern day nation of Israel is a flag God has raised among the nations of the world, signaling the hour of His return is near. Just as God promised, He has gathered a remnant of His people from among the nations where they were scattered and brought them back into the land of Israel. We are living in the end times, and we have reason to believe God's future promises will be fulfilled as well. While our planet will not be destroyed, the end of this age is near and the world as we know it will come to end. If not, take time now to learn more about Him. Read the Bible and explore this site. Learn everything you can, and if you're inclined to do so, make a commitment to follow Jesus Christ. Amen! And come Lord Jesus!